The Supervillain and Me is Danielle Banas’s debut novel and the latest addition to the Swoon Reads collection. As an avid superhero film watcher, I was excited to dive into this one! Abby Hamilton is the daughter of the city’s mayor and sister to the city’s beloved superhero, Red Comet. With a family like that, she isn’t surprised of much. However, while walking home from school one day, she’s mugged. Instead of Red Comet coming to her rescue, a new superhero she’s never heard of saves her—that is until she sees a video of him burning down city hall the next day. Dubbed “Iron Phantom” by the media, her mysterious savior seems to be more villain than hero until he appears in her bedroom with news of something strange happening. 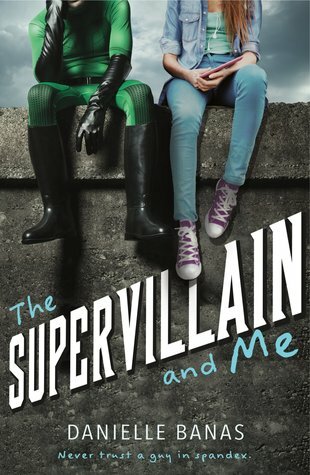 The Supervillian and Me is a fun, mystery-filled novel that kept me at the edge of my seat in anticipation as Abby tried to figure out the mysterious Iron Phantom’s identity and as they teamed up to figure out what was going on in their city. I loved Abby’s narration in the book, which was very personable and funny. Her interactions with the other characters were fun—I especially loved seeing her interact with Iron Phantom and his”real-life” self as well as with her brother Connor. While reading The Supervillian and Me, I thought a lot about the Incredibles. It might just be because the second movie was just released, but the supers’ identities being concealed from their real lives and the crime-ridden city really reminded me of it. Just think of it as more high-school-y version with more romance and less adventure. There’s definitely some action-packed scenes, but there’s mostly a lot of dialogue—the scenes mostly take place in Abby’s room or at school during rehearsal for the school’s musical. Overall, The Supervillian and Me is a fun, fast-paced read! Fans of the Incredibles will love this book! This sounds like a great read and very entertaining overall! Great review! Thanks, Giselle! It certainly was very entertaining! Thank you! I hope you get a chance to read the book! This sounds super cute! I don’t read enough superhero novels and I love ones that have a dash of humour to them! I haven’t really read any superhero novels either, which is funny because I watch basically all of the movies that come out! This sounds fun! I’ve never read a superhero book, but definitely need to change that! Great review!